Butch Childers graciously gave us permission to use these photos of a Paper Nautilus shell that he found on Melbourne Beach last week. Wanting to tell you everything you ever needed to know about this creature, I began my research on the Internet. On the sea-bean web site, I discovered that the Paper Nautilus is also called an Argonaut, is a mollusk, and lives a pelagic existence in the tropics and subtropics. Although this part of the shell looks like paper, it is contructed of calcium carbonate (like most seashells) by the female for the purpose of protecting her eggs. A good explanation, to be sure, but too clinical for such a lovely shell. So I turned to a poet and an author for help. ...the paper nautilus constructs her thin glass shell. Giving her perishable souvenir of hope a dull white outside and smooth-edged inner surface glossy as the sea, the watchful maker of it guards it day and night; she scarcely eats until the eggs are hatched. And then I turned to Anne Morrow Lindbergh's "Gift from the Sea" written in 1955. This is a fine, contemplative book - I suggest you read it while sitting on a quiet beach. (It should be required reading for Baby Boomers.) Chapter 6 is devoted to the Argonauta. While the author may have taken a little poetic license, she certainly captured the essence of this dainty creature. There are in the beach world certain rare creatures, the "Argonauta" (Paper Nautilus), who are not fastened to their shell at all. It is actually a cradle for the young, held in the arms of the mother argonaut who floats with it to the surface, where the eggs hatch and the young swim away. Then the mother argonaut leaves her shell and starts another life. .... Almost transparent, delicately fluted like a Greek column, this narcissus-white snail shell is feather light as some coracle of ancient times, ready to set sail across unknown seas. Our thanks to Butch for sharing his lovely gift from the sea. I was brought to tears when I read Marge's blog about my rare find on our beach. "A Gift From The Sea" was one of my mother's most cherished readings as she was a lover of nature which she taught to all of her 5 children. I have never met Marge so she did not know how personal our joint love of this beautiful specimen would be when she composed her blog. I thank her greatly for her beautiful usage of such fine literature and reminding me of my mothers love. A friend sent the following comment in an email: What an incredible find on such a wave-lashed coast. And it's comments like those that make blogging so rewarding. 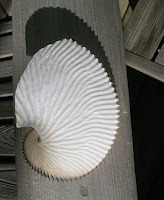 I found a Paper Nautilus yesterday on the high tide mark on Hutchenson Island, Stuart. It was amazing. After the storm the night before, all the shells were broken except my one rare find. I will treasure it always. Melanie - sorry to be so late in responding to your comment - computer issues. I'm so glad your paper nautilus was found by someone who will love it! If you have not read "A Gift from the Sea", I hope you will. Thanks for sharing your good news. A Field Trip to the Beach!